The Goodness Of Coconut by Emily Jonzen is divided into sections such as milk and water, oil, flour and desiccated – all the different formats that the coconut typically takes. There are both sweet and savoury recipes, but I couldn’t resist picking two naughty but nice desserts this week. The salted banoffee pots and pancakes are simply delicious. Enjoy! First make the toffee. Pour the coconut cream and sugar into a small saucepan and place over a medium heat. Bring up to a boil and simmer for 6-8 minutes, stirring frequently, until thickened. Stir in the salt and set aside to cool. When the toffee has cooled to room temperature, transfer it to a bowl, cover with cling film and refrigerate for at least 2 hours. It can be made up to a week in advance. For the base, place all the ingredients in a food processor and blitz until fairly smooth and sticky. Divide the mixture among four glasses or ramekins and leave to set in the fridge for an hour. For the topping, whip the coconut cream with an electric whisk until thickened. Then scoop a spoonful of the toffee onto each base and spread it out a little to reach the edges. Scatter over the banana slices, dollop some coconut cream on each one, and sprinkle the chocolate on top. Serve immediately. First make the batter. Sift the flour and baking powder into a mixing bowl. Stir in the salt and make a well in the centre of the flour. Pour in the oil and eggs and whisk to gradually incorporate the flour. Whisk in enough milk to achieve a double cream consistency. Heat a little coconut oil in a large, non-stick frying pan and drop 2 tbsp of the batter into rounds, leaving a little space between each. Fry the pancakes for 1-2 minutes. When the edges are set and there are bubbles covering the surface of the pancakes flip them over and continue to cook for a further 1-2 minutes until risen, golden and fluffy. Set aside and keep warm while you repeat the process until the batter has been used. Keep the pan on the heat and add a little more oil. Tip in the sliced bananas and fry for 30 seconds. Pour in 2 tbsp of the maple syrup, turn the bananas over and fry for a further 30-60 seconds. 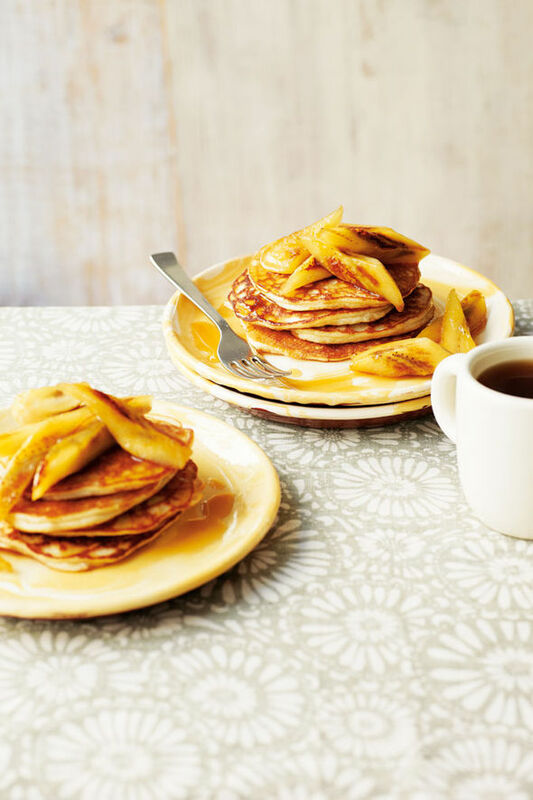 Serve with the bananas and the remaining maple syrup.